June 2018: My studio and other events. This will be a short blog after the mammoth job of writing up the series from my textile tour to the Lesser Sunda Islands. However life has been busy. Soon after arriving home I was off to Canberra for the weekend to teach for the guild there. There were a great group of weavers who were enthusiastic about learning Summer and Winter. Great results were achieved but unfortunately, I forgot to take photos. Twelve students had at work. And then it was home for a 5 day “Special”. The three students had the opportunity to weave whatever project they wanted. Rochelle and Jan had both missed out on the twill class so decided that this was an ideal opportunity to expand their knowledge. 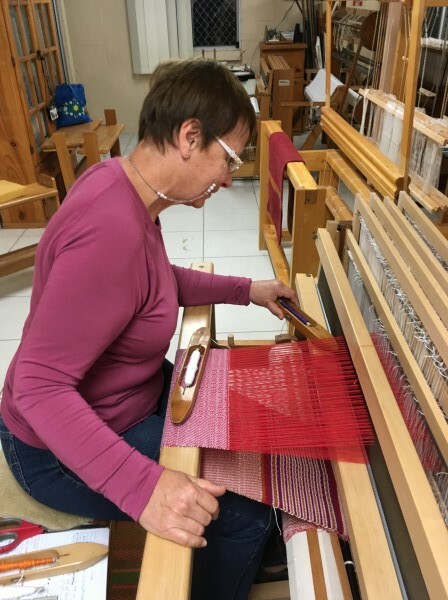 Jan took delight in weaving a set technique and then threw caution to the wind and developed some exiting variations. 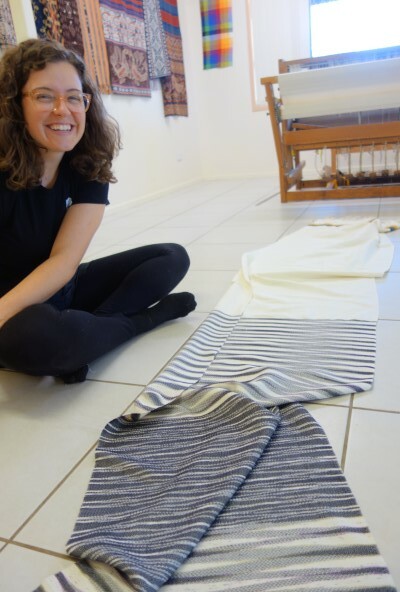 Rochelle completed variations on a theme by exploring treadling sequences for her 3 scarves. They are all quite different. Katie, from the USA had been travelling in S. E. Asia and stopped off for the class. 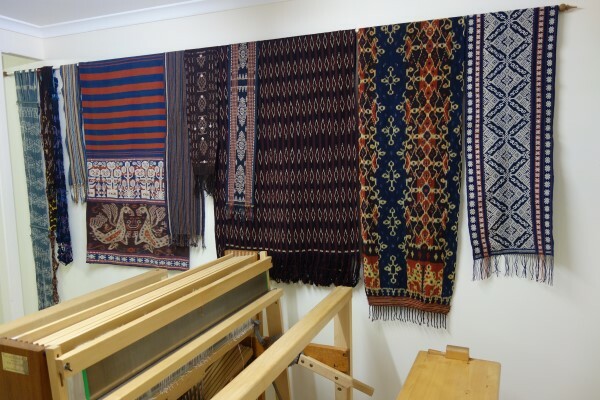 Her project was to weave fabric for a tunic in weft ikat and silk. 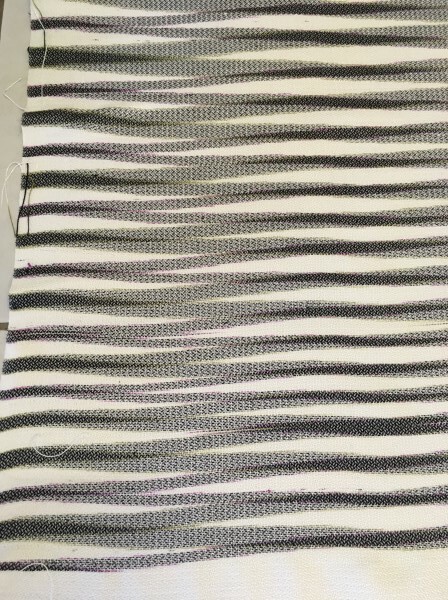 Here’s the fabric just off the loom. A close up view of one of the sections. 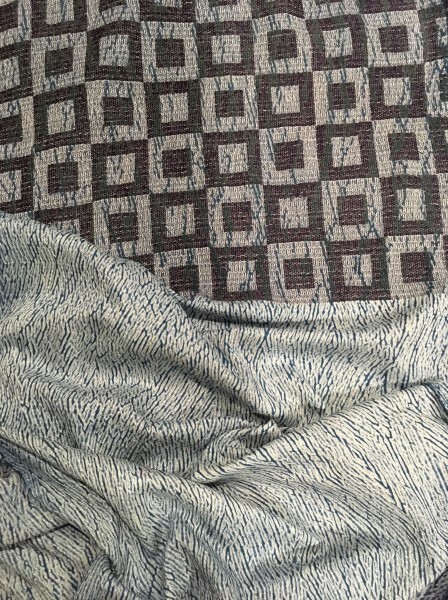 3 dye baths were required to achieve this ikat. There’s a hint of olive or pink at either edge of the black. I have finally got this piece of weaving off the loom. It’s taken a while but then again, I guess you have to be home to weave. And it was at about this stage that I wondered why I did weft shibori. 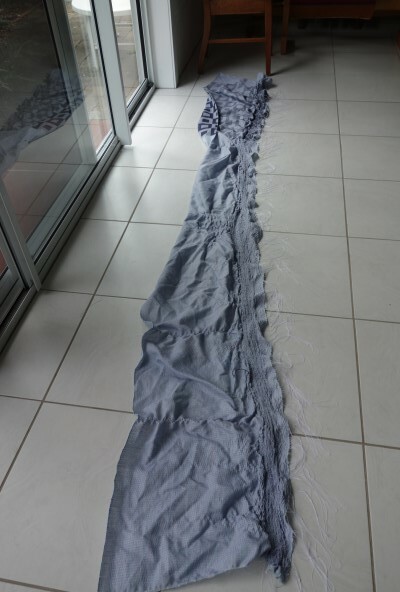 Warp shibori would have taken way fewer threads to pull up. And then some indigo. After my trip, there was a definite pull towards indigo as a preference. And the great undoing. I’m very happy with the result. 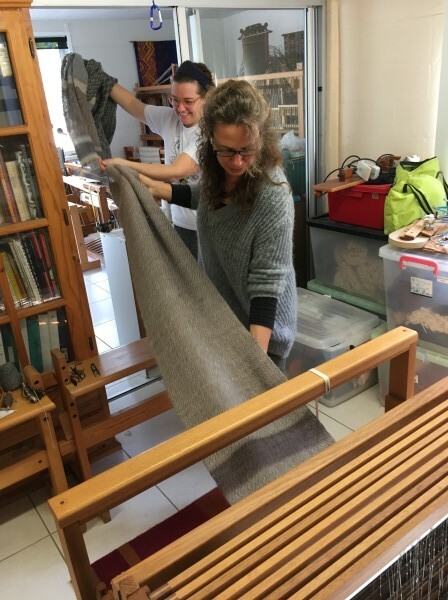 I have been asked by several weavers about running a one day a month studio class at my studio. So on a Monday from September to November inclusive the studio will be open. 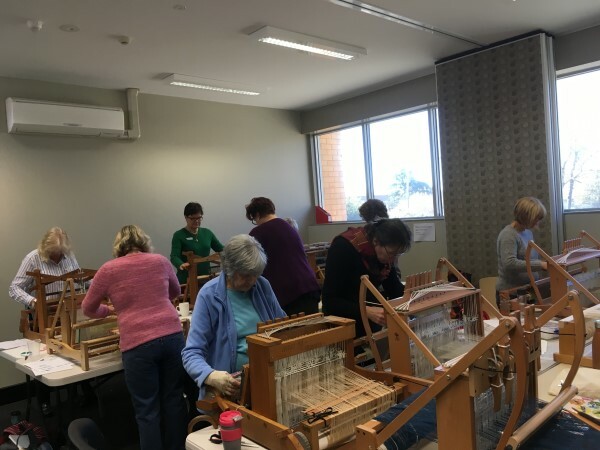 I’m calling this a BYO loom class. Students will be required to bring their own loom. They may do any project according to their personal requirements. It may be to learn to weave or brush up on some skills for a beginner or something more advanced for the more experienced or even designing and planning a series. My intention is to provide the framework that allows students to decide on a project, have the month to weave and then bring it back for evaluation before starting a second one. All the details are on this blog under “Kay’s Weaving School” at the top of this blog. I’m enjoying my Textile Wall. It is certainly bringing back great memories and it was certainly way too early to put away those wonderful textiles from my last trip. 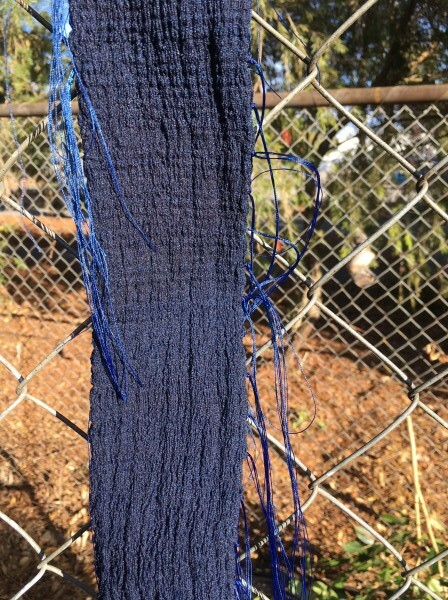 This entry was posted on Tuesday, July 3rd, 2018 at 10:01 pm and is filed under Dyeing, Kay's weaving school, student work, The studio, Uncategorized, Weft ikat, workshops, Woven shibori. You can follow any responses to this entry through the RSS 2.0 feed. You can leave a response, or trackback from your own site.